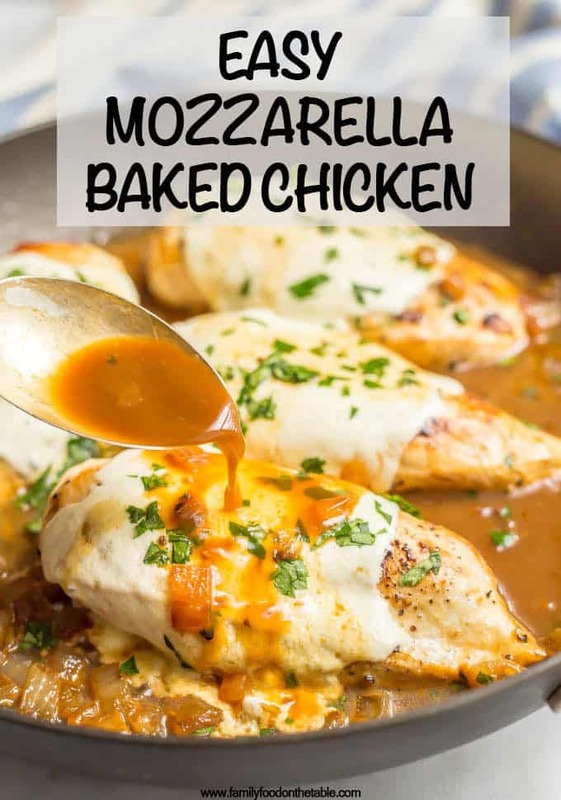 Easy mozzarella baked chicken has just a few simple ingredients but BIG flavor! It’s warm and cheesy, requires just 6 ingredients and is ready in 25 minutes, making it perfect for a quick dinner everyone will love! I am surprisingly happy to see a new week, given that we lost an hour of sleep over the weekend for daylight savings time. Or maybe it’s the date night I have with my dad tomorrow night. My mom’s going to be out of town so I get to go to dinner and to see the play Waitress with him. I *adored* the movie, so I’m really excited to see it live on stage. And have a fun night out with my dad! And despite the fun outlook, it’s also going to be a busy week. #whatelseisnew? 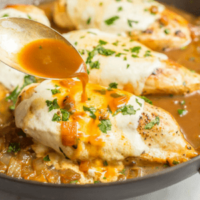 So today’s easy mozzarella baked chicken recipe is perfect when you want something that’s simple but scrumptious. Cause quick + easy doesn’t mean you have to sacrifice flavor, right? And this melty, cheesy chicken is sure to satisfy kids and adults alike, making it perfect for a fuss-free family dinner on a busy weeknight! Besides perhaps the fresh mozzarella (and you can see my cheat note about that below), this is all basic ingredients you probably already have on hand! So those nights when you don’t know what to do or what to make? 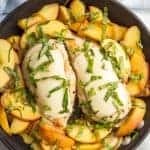 The cooking time will depend on the thickness of your chicken breasts. You’ll want 4 that are a similar size so they cook evenly. If yours seem thick, you can pound them out between wax paper to make sure they are a good, even size for cooking. Also, I always recommend using a meat thermometer to ensure your chicken is cooked through! I love this instant read one and you’ll want the chicken to be at 165. Mushroom lover? Me too. Feel free to add 8 oz. of sliced mushrooms to the pan with the onion, until they are cooked down and have released their juices, then continue with the recipe. 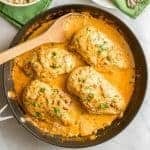 My easy baked mozzarella chicken doesn’t have a tomato sauce but if that’s what you’re looking for, you can add a small can of diced tomatoes (or crushed tomatoes) to the pan after you’ve browned the chicken. Fresh mozzarella really is best here, but I won’t tell if you want to top the chicken with some sliced or shredded mozzarella. It won’t be quite as flavorful but still delicious. 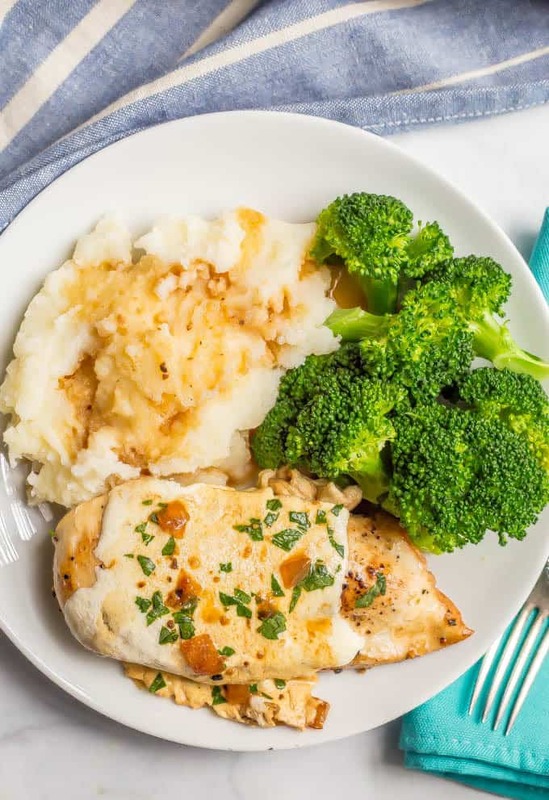 We love this mozzarella chicken served with mashed potatoes (drizzle some sauce over those too, as seen below), but it would also be great with pasta or brown rice as well. 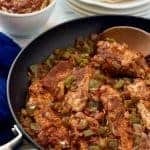 You could even do spaghetti squash for a low-carb option. Or serve it with polenta. Or just some crusty bread. So many options! 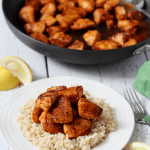 Give this a try for a new easy dinner-time favorite! 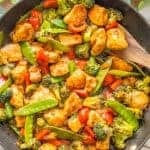 And be sure to check out my collection of easy chicken dinner recipes and chicken recipes in under 30 minutes. 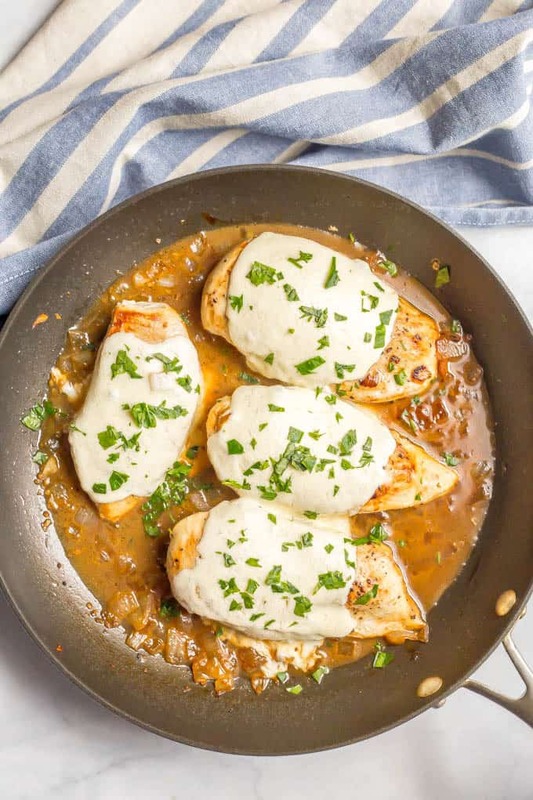 Easy mozzarella baked chicken has just a few simple ingredients but BIG flavor! And it's ready in just 25 minutes! Add onions and sauté for 3-4 minutes, stirring occasionally. Add garlic and sauté for another 30 seconds. Sear chicken breasts on each side for 3-4 minutes, until well browned. 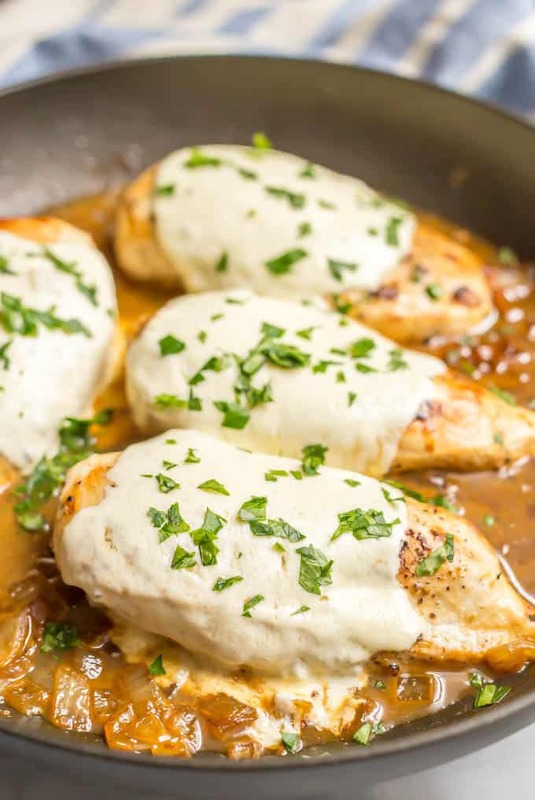 Add a slice of mozzarella to the top of each chicken breast. Add broth and marsala to pan. Cover the pan with a lid. 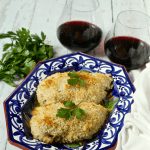 Transfer the skillet to the oven and bake for 8-12 minutes, until chicken is cooked through. 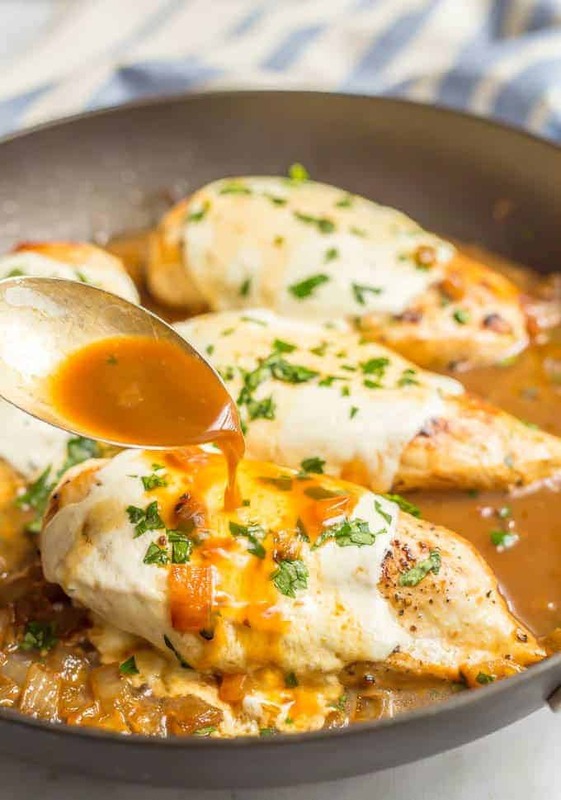 Serve hot with extra sauce spooned over each chicken breast. Mushroom lover? Me too. Feel free to add 8 oz. of sliced mushrooms to the pan with the mushrooms, until they are cooked down and have released their juices, then continue with the recipe. Fresh mozzarella really is best here, but I won’t tell if you want to top them with some sliced or shredded mozzarella. It won’t be quite as flavorful but still delicious. Oh have fun with your Dad tomorrow! How do I help you get more advertising??? I’m so happy to hear you loved it! Quick meals are the best meals, right?! This will be a sure hit for busy nights!